More than 165,000 species of caterpillars in the order Lepidoptera (phylum Arthropoda, class Insecta) exist. About 150 are of medical importance. This importance lies in the ability of many species to induce an irritant or toxic dermatitis in humans and in the ability of some species to sting. Caterpillars are the larval forms of moths and butterflies. After hatching from their eggs, caterpillars pass through 4-5 instars (stages between molts) before they pupate in a cocoon. The adult moth or butterfly emerges from the cocoon to reproduce the next generation. More than 50 species in the United States alone are capable of inflicting a painful sting. Seasonal epidemics of dermatitis can occur when caterpillars are numerous. 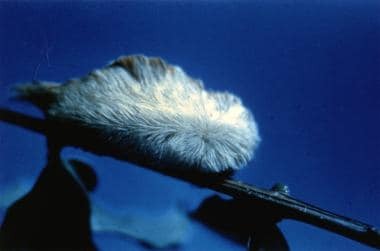 The most dangerous caterpillar in the United States is the puss caterpillar or asp (Megalopyge opercularis; shown in the image below), the larval form of the flannel moth. It is found throughout the Southeast, from Maryland to Mexico. Stings from this species are common from June through September. Caterpillar envenomations. Puss caterpillar or asp. Photo courtesy of the Arizona Poison and Drug Information Center. Human disease from caterpillars or moths usually arises from direct contact, exposure to substances or animals that have been infested with caterpillars or their webs, or contact with airborne caterpillar debris. Diaz classifies the diseases caused by caterpillars into 5 groups: erucism, lepidopterism, dendrolimiasis, ophthalmia nodosa, and consumptive coagulopathy with secondary fibrinolysis. Erucism (caterpillar dermatitis) is characterized by a localized, pruritic, maculopapular contact dermatitis and urticaria, and follows contact with toxic hairs, spines, or hemolymph, either directly or following aerosolization. Lepidopterism is a systemic illness that occurs following such contact, and it is typified by diffuse urticaria, upper airway inflammation, nausea, vomiting, headache, and bronchospasm. Dendrolimiasis is a more chronic illness that follows contact with the Asian Dendorlimus pini caterpillar. Patients with this disorder demonstrate a pruritic maculopapular rash and migratory polyarthritis/polychondritis, which can progress to chronic osteoarthritis. Occasionally, acute scleritis occurs as well. Ophthalmia nodosa presents with acute conjunctivitis, progressing to panophthalmitis, following penetration of the cornea by urticating hairs. Consumptive coagulopathy with secondary fibrinolysis occurs most commonly following stings by the South American Lonomia caterpillar whose venom activates factor X and prothrombin. Patients can demonstrate bleeding from almost any anatomic site and may develop acute (and possibly chronic) renal failure. Caterpillar venoms are produced by glandular cells in the epithelium and are stored in and injected by urticating hairs and spines (setae). Some species produce toxic hemolymph, which can cause human disease. In some patients, immunoglobulin E (IgE) antibodies are produced following contact, resulting in a hypersensitive state and the production of generalized urticaria on subsequent re-contact. A few caterpillars lacking urticating hairs are capable of inducing a contact dermatitis (type IV hypersensitivity). Some caterpillars and moths release their toxic hairs into the environment, where the hairs can be inhaled. Pets or contaminated objects also can carry venomous hairs. In any of these situations, contact with the hairs can cause rhinitis or respiratory disease. Seasonal epidemics of respiratory disease have occurred in Latin America because of this phenomenon. The pathologic response leading to erucism or lepidopterism consists of acute inflammation and cellular infiltration around hairs that have penetrated the skin or conjunctiva or have been inhaled into the respiratory tract. In the skin, diffuse vascular dilatation occurs, with subsequent edema formation in the superficial dermis and ballooning of keratinocytes within the epidermis that can lead to vesiculation. In the eye, hairs have a remarkable penetrating capacity and may work their way into the cornea, anterior chamber, or lens, where an intense inflammatory response occurs secondary to the nature of the foreign material and direct toxic effects. Caterpillar venom-filled spines, found only in the larval forms (adult moths and butterflies do not sting), are hollow structures with a single basal poison cell that produces toxin. When pressed into human skin, the tip of the spine fractures, and the venom is injected under pressure. Toxicity declines significantly after the creature's death, but irritant or toxic hairs may retain the ability to cause dermatitis for years. Likewise, the toxic hemolymph of some caterpillars retains its potency for prolonged periods after the animal's death. Caterpillar venoms are poorly studied but may contain peptides, hyaluronidase, phospholipase A, and biogenic amines such as histamine or histamine-releasing substances. Some, such as the South American Lonomia species, contain fibrinolytic proteases and coagulation activators that can stimulate a consumptive coagulopathy and renal failure in victims. Although no accurate information is available, epidemics of erucism and lepidopterism have been reported. These include school closings, outbreaks of dermatitis and rhinitis in the thousands, and symptoms in more than 500,000 people caused by airborne caterpillar hair dispersion. No accurate information is available, though it appears that the incidence of human disease is increasing. Children, being prone to want to play with caterpillars, may be at increased risk of exposure. The prognosis is generally excellent. Occasional case reports of death from erucism exist, but death is very rare following stings by most species. Death may be secondary to a hypersensitivity reaction or bleeding diathesis in cases involving caterpillars of the Saturniidae family. In this family, South American Lonomia caterpillars have a high fatality rate (approximately 1.7%) due to the toxicity of their venoms and the fact that many exposures lead to multiple stings due to the communal nature of these species. No deaths have been reported following M opercularis stings. Reported complications include panophthalmitis, consumptive coagulopathy, intracranial hemorrhage, renal failure, and osteochondritis. Bonamonte D, Foti C, Vestita M, Angelini G. Skin Reactions to pine processionary caterpillar Thaumetopoea pityocampa Schiff. ScientificWorldJournal. 2013. 2013:867431. [Medline]. Iacobucci G. Oak moth caterpillar that causes rash is spreading in southeast England. BMJ. 2013 May 8. 346:f2964. [Medline]. Wills PJ, Anjana M, Nitin M, Varun R, Sachidanandan P, Jacob TM, et al. Population Explosions of Tiger Moth Lead to Lepidopterism Mimicking Infectious Fever Outbreaks. PLoS One. 2016. 11 (4):e0152787. [Medline]. DuGar B, Sterbank J, Tcheurekdjian H, Hostoffer R. Beware of the caterpillar: Anaphylaxis to the spotted tussock moth caterpillar, Lophocampa maculata. Allergy Rhinol (Providence). 2014 Jul. 5 (2):113-5. [Medline]. Bleriot A, Couret C, Lebranchu P, Le Meur G, Weber M. [Keratitis due to foreign bodies from a processionary caterpillar nest]. J Fr Ophtalmol. 2015 Jan. 38 (1):85-6. [Medline]. Prasad SC, Korah S. Rare Presentation of Ophthalmia Nodosa. Middle East Afr J Ophthalmol. 2015 Oct-Dec. 22 (4):520-1. [Medline]. Casado Verrier E, Carro Rodríguez MA, de la Parte Cancho M, Piñeiro Pérez R. [Systemic reaction after pine processionary caterpillar ingestion. Conservative management?]. Arch Argent Pediatr. 2016 Jun 1. 114 (3):e151-4. [Medline]. MacKinnon JA, Waterman G, Piastro K, Oakes J, Pauze D. Oropharyngeal Edema in an 8-Month-Old Girl after Woolly Bear Caterpillar Exposure. J Emerg Med. 2015 Nov. 49 (5):e147-9. [Medline]. Sánchez MN, Mignone Chagas MA, Casertano SA, Cavagnaro LE, Peichoto ME. [Accidents with caterpillar Lonomia obliqua (Walker, 1855). An emerging problem]. Medicina (B Aires). 2015. 75 (5):328-33. [Medline]. Maggi S, Faulhaber GA. Lonomia obliqua Walker (Lepidoptera: Saturniidae): hemostasis implications. Rev Assoc Med Bras. 2015 May-Jun. 61 (3):263-8. [Medline]. Medeiros DN, Torres HC, Troster EJ. Accident involving a 2-year-old child and Lonomia obliqua venom: clinical and coagulation abnormalities. Rev Bras Hematol Hemoter. 2014 Nov-Dec. 36 (6):445-7. [Medline]. Schmitberger PA, Fernandes TC, Santos RC, de Assis RC, Gomes AP, Siqueira PK, et al. Probable chronic renal failure caused by Lonomia caterpillar envenomation. J Venom Anim Toxins Incl Trop Dis. 2013 Jun 3. 19 (1):14. [Medline]. Lipkova B, Gajdosova E, Kacerik M, Duranova M, Izak MG. Caterpillar setae penetration in an eye: long-term follow-up. Retin Cases Brief Rep. 2013 Summer. 7 (3):252-4. [Medline]. Sridhar MS, Ramakrishnan M. Ocular lesions caused by caterpillar hairs. Eye (Lond). 2004 May. 18 (5):540-3. [Medline]. Hossler EW. Caterpillars and moths. Dermatol Ther. 2009 Jul-Aug. 22(4):353-66. [Medline].